8-Way? ?is a complete boiler water treatment (nonchromate, biodegradable) for both steam and hot water systems. 1. Removes sludge. 2. Removes rust scale. 3. Inhibits boiler corrosion. 4. 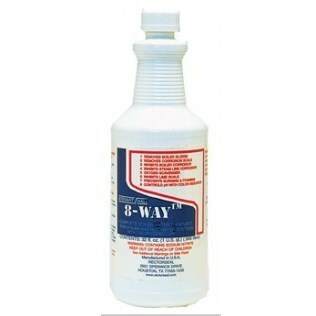 Inhibits steam line corrosion. 5. Prevents oxygen pitting. 6. Inhibits lime scale. 7. Prevents surging and foaming. 8. Controls pH with a color indicator. Does not contain petroleum distillates. Will not damage seals and gaskets.